It is seriously perhaps the easiest treat to whip up, and it’s packed with nutrition. I got started on the chia kick when I had a delicious chia seed pudding with blueberries from Kornerstone Cafe and Juice Bar, here in East Aurora. Ever since, I’ve been making them in pint jars and having one every few days. 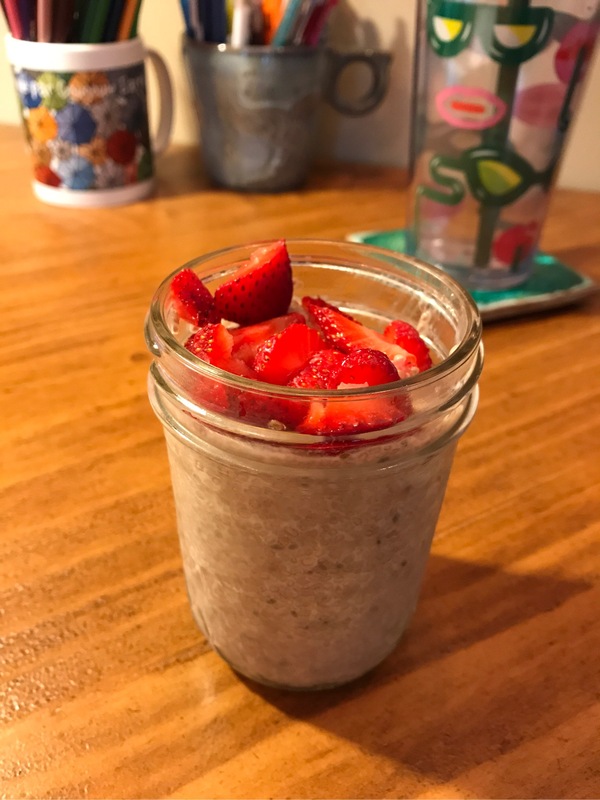 One thing I did find was that MY chia seed pudding didn’t seem to ‘gel’ quite like the commercial varieties (those I’ve seen in stores, cafes, etc..). Yes, my pudding gelled well and had the right consistency. However, the seeds didn’t ever seem to swell or get as translucent as others I’ve seen. This was especially true when I made the chia cherry jam. Not a complaint, simply an observation. I think what I love the most is that I’m having a really nutritious treat when I’m eating chia seed pudding. For one serving, I’m getting approximately 240 calories (180 in seeds, 60 in almond milk), 9-12 grams protein, 15 grams fiber and 7.5 grams omega-3 fatty acids. That’s a great mid-afternoon snack!